The Waber-by-Tripp Lite DG115-SI Power Strip offers a convenient method of power distribution and surge suppression in workbench, wallmount or floor mount applications. Includes 6 NEMA 5-15R output receptacles, 6 foot AC line cord and keyhole mounting tabs for installation in a wide variety of applications. Protects connected equipment from transient surges and line noise with built in surge suppression rated at 2100 joules. Corded, multi-outlet strip reduces cabling clutter and enables the connection of multiple electrical devices to a single AC wall socket. Features metal housing, lighted power switch with integrated 15 amp resettable circuit breaker and attractive gray color scheme. 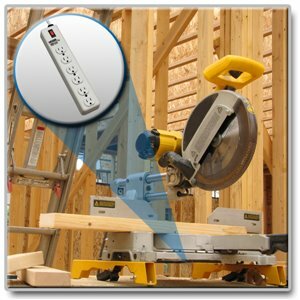 Worksite power distribution and surge protection just became a lot easier. With Tripp Lite’s DG115-SI Metal Surge Protector, you’ll have reliable, protected outlets where you need them, even in physically demanding environments. Constructed of an all-metal housing, the DG115-SI is ideal for applications that require the highest level of safety and durability from power spikes. More joules mean more protection! The DG115-SI provides a highest-in-class 2100 joules of surge suppression to prevent even the strongest surges from damaging your valuable electronics. Includes both full normal mode (H-N) and common mode (N-G/H-G) line surge suppression. Various electromagnetic and radio sources can cause disruptive interference on the AC line. Known as EMI (electromagnetic interference) and RFI (radio frequency interference), this line noise is a common cause of performance problems and can also lead to incremental hardware damage and data corruption. The DG115-SI incorporates technology that filters out disruptive line noise for peak performance of your components. Premium features include a lighted On/Off switch that provides convenient power control and allows you to see at a glance whether the DG115-SI is operational. A green LED confirms surge protection status. For added safety, a built-in, 15-amp circuit breaker prevents dangerous circuit overloads that could damage equipment and immediately shuts off AC input to the DG115-SI when it detects that the equipment load is drawing too much power. The DG115-SI is certified to UL1449 3rd Edition and UL1363 standards. For peace of mind, the DG115-SI comes backed by a lifetime warranty. The DG115-SI is also manufactured in compliance with strict RoHS specifications, reflecting Tripp Lite’s commitment to environmental responsibility.